In order to create a VB study, the CT images are modified or ''reconstructed.'' This step needs to be performed while the CT scanner still has the raw data available on the computer. The helical images, which are automatically acquired incrementally, are computer processed to overlap each other at smaller slice intervals. In other words, when 3-mm-slice-thickness images are reconstructed at 1-mm intervals, they are recreated to overlap each other every 1 mm rather than sequentially. Reconstruction of images from the multidetector scan includes creating thinner slices as well as overlapping images. For instance, for a scan obtained with the GE Lightspeed CT scanner, images can be acquired at 5-mm slice thickness with the HS protocol and reconstructed to 2.5-mm slice thickness with 1-mm slice spacing (Table 1). 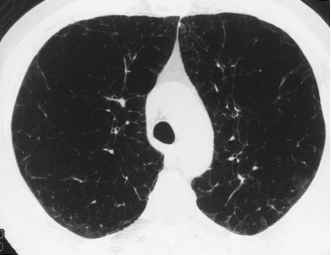 Figure 1 (A) Computed tomography scan of the thorax of a 60-year-old woman who was unable to completely hold her breath during acquisition of the CT scan. Image detail of the lungs are blurred (arrows). 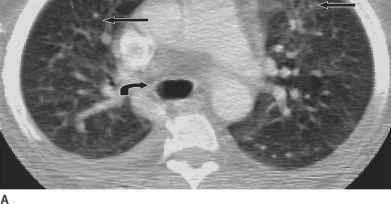 The trachea outline shows a double density (curved arrow). 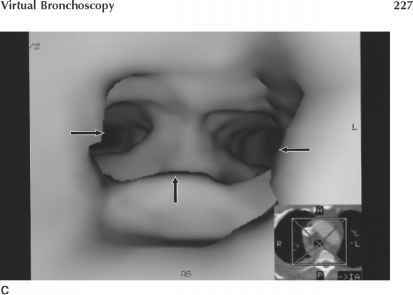 (B) Coronal planar reconstruction shows rippling (arrows) along the trachea, also referred to as stairstepping artifact. (C) Surface-rendered virtual bronchos-copy image at the level of the trachea shows numerous ridges or stairstepping artifact (arrows) along the airway that create artifactual narrowing. Figure 2 Surface-rendered 3D reconstruction of the trachea in the coronal view shows multiple stair-stepping artifacts (arrows), which can result from respiratory motion, slice thickness greater than 3 mm, or failure to reconstruct images at overlapping slices. The reconstruction of CT slices at thinner intervals provides a smoothing feature to the three-dimensional generated structure. Normally reconstruction for three-dimensional imaging is performed at 1- to 2-mm overlap for 3- to 5-mm slice thickness. A thicker reconstruction interval leads to irregularity or rippling to the three-dimensional airway wall that is termed ''stairstepping'' (Figs. 1 and 2) [12,13]. Stairstepping not only creates an image that is distorted from the true anatomic airway, it also creates artifactual narrowing . Once images are reconstructed, they are transferred to a separate and independent computer. There, the images are imported into a specific software program that creates the three-dimensional images of the airway with virtual bronchoscopy capabilities.